First off, WELCOME TO SAN FRANCISCO! The Bay. The City. Nor Cal. You'll never find yourself bored in SF with its neighborhood diversity, steep rolling hills, mountainous terrain, and of course, The Bay. Our DIAKADI Trainers recommended their favorite activities that will want you coming back for more. Hey SF tourists and surfer newbies! Adventure Out is an awesome adventure team that helps people fall back in love with nature. They offer a number of high quality and safe outdoor programs including wilderness survival, backpacking, rock climbing, mountain biking, adventure retreats and SURFING. Get on the water for their 1 day or 2 day surf clinics in Pacifica or Santa Cruz. These 3 hour classes are welcome to all levels but as a beginner, you'll learn the basics and be catching waves in no time. Embrace the California surfer lifestyle on your next visit to San Francisco. You can start saying things like "rad" and "stoked" and "no waves, no glory". Click the link below for details and to book your next lesson. 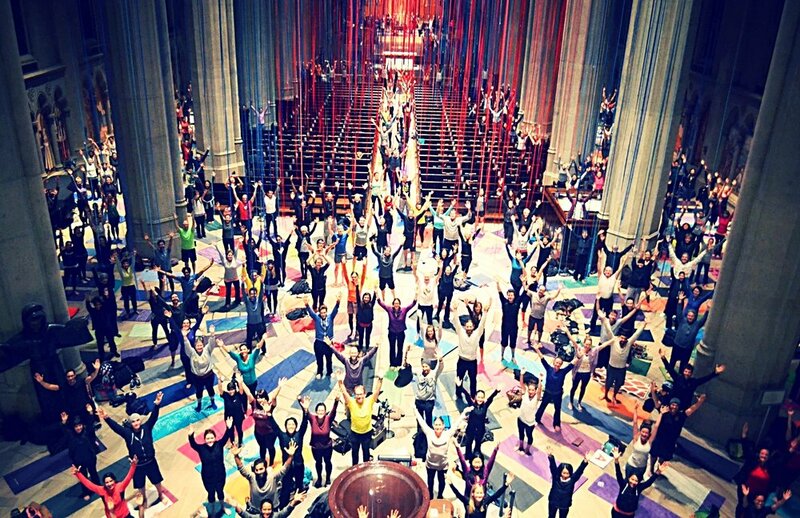 Yoga on the labyrinth at Grace Cathedral is a unique experience. Several hundred people of all ages, from all over the city, of many different faith affiliations, including none, gather as ONE to practice yoga in the darkened cathedral. Colorful mats cover the labyrinth, the aisles and even the altar. Tuesday yoga exemplifies their commitment to meeting people where they are and recognizes there are many ways to be spiritual. Everyone is welcome and they have mats to loan for a small donation if you don’t have one. Tuesday Yoga is free however donations are welcomed! Your donation helps support the teacher, the musicians and keeping the cathedral open for yoga. This hidden gem is a must go on your next trip. Class starts at 6:15p - 7:30p but get there early as it is a popular class! Click on the link below find class schedules, service times, reflections, musicians, and MORE. Namaste. Take in the BAY-eautiful views of San Francisco from the water! Kayak (1 or 2 person seating) or try using the Stand Up Paddleboards (SUPs) in the Richardson Bay along the coast of Sausalito, just north of the city across the Golden Gate Bridge. Renting, teaching, and leading trips for over 34 years, SeaTrek was the first commercial sea kayaking business in California. Whatever your skill level and experience, you will find the Sea Trek staff ready to help make your adventure safe and enjoyable. There are NO RESERVATIONS as it is first come, first served. However they have a large fleet of kayaks with high turnover so no worries, they will always get you on the water! This is the PERFECT escapade for tourists anytime of the year - They are open for rentals ALL YEAR, 7 DAYS A WEEK. Click the link below to check out rates, memberships, and other info to plan your adventure. Find your floating home here next time you're in SF! One of San Francisco's tallest mountains, Mount Diablo with an elevation of 3,849 feet, has some of the most expansive views in California. For our history buff tourists, this mountain played a large role in the surveying the Bay Area during its early discovery. It is 6.8 miles from leg to summit, so wear your hiking boats, pack your water, snacks, and optimism because it's a bit of a trek. The reward after this mountainous feat? Head to ØL Beercafe & Bottle Shop and treat yourself to a pint. Beer isn't your thing? Get your sugar fix at A Sweet Affair. Either way, you can now say you've hiked SF's Mount Diablo. Click the link below for different trails, directions, map of the park, hours of operation, what to bring, and more mountains to climb on your next trip to SF. With basketball courts, tennis courts, walking path, and a playground for kids, Dolores Park in San Francisco's Mission District, is an awesome spot for your next family vacation. Start a pick up game of basketball, bring your tennis racquets, and make your way up the hill to enjoy the views of the city from the top of the park. Being the recreational MVP must get tiring.. Go across the street and grab a bite at Dolores Park Cafe or treat yo'self to ice cream at Bi-Rite Creamery, have a picnic in the park, and soak up the SF sun. Click the link below for directions to Dolores Park and other fun recreational activities for you and your friends to enjoy! This is always a tourist favorite. After visiting Fisherman's Wharf, stop at a bike rental shop there and hop on a tour that will take you across the Golden Gate Bridge into Sausalito. After the bike tour, you'll take a ferry back to your starting location in the city, ending with a relaxing boat ride. Sounds awesome right? Click the link below for routes, rates, map and directions, and other walking and bus tours so you can get the most out of your trip to San Francisco. The City hopes to see you again soon! Featured on Round the World Magazine - "San Francisco for the Active Tourist"